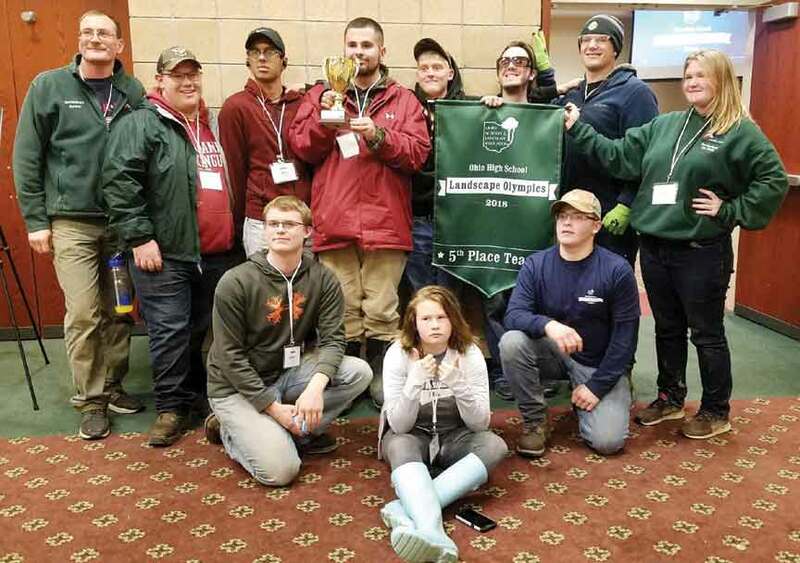 JEFFERSON TOWNSHIP - Students from the Horticulture, Landscaping, & Parks Management program at the Ashtabula County Technical & Career Campus (A-Tech) showed they are some of the most talented in the state this month at the Ohio High School Landscape Olympics. A-Tech students took 5th place in a field of 20 schools. Students were tested in a variety of areas, including compact excavator and skid steer operation, plant and hardscape installation, landscape maintenance, irrigation, truck and trailer maneuverability, and cost estimating. In all, about 230 students from around the state competed at the event, which is sponsored by the Ohio Nursery and Landscape Association (ONLA). “It was fun to compete with other kids and see what you were better at and what you need to improve,” said senior Spencer Campbell. “It took a lot of teamwork. You drive around cones with a truck and trailer, and you had to back in at a 90 degree angle with a spotter helping you. It was pretty hard,” he said. Senior Madisen Miller said the events helped her gain confidence. “Sometimes I overthink it too much. But (having success) helped me realize I know what I can do,” she said. Senior Shawn Trembly was part of a team that assembled an irrigation system. “We had to put together sprinkler heads and my team was the fastest to get it done,” he said. “I liked meeting new people and seeing what the other schools are learning,” said Rachel Degan. She also noted the wet weather was a factor in the competitions. “If you have a good attitude, your day will have good results,” she said. This is the third year for the Landscape Olympics, which took place Nov. 1-2 at The Ohio State University Agricultural Technical Institute in Wooster. The ONLA hopes the competition will broaden the students’ educational experience and introduce them to the many career opportunities in Horticulture and Landscaping. “Contests like this show our students how the skills they learn in this program can really expand their opportunities,” says Noble. Front: Shawn Trembly, Rachel Degan and Spencer Campbell. Back: Instructor Ken Noble, Tanner Sackett, Elias Pizarro, Kyle Mason, Kodi Wick, Aerick McCullough, Josh Tantari and Madisen Miller.